Working from home can take different forms. 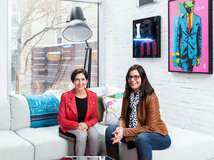 These interior designers, architects and landscape architects featured in our My Houzz series have carved out six special places to run their businesses from home. Let’s take a look. 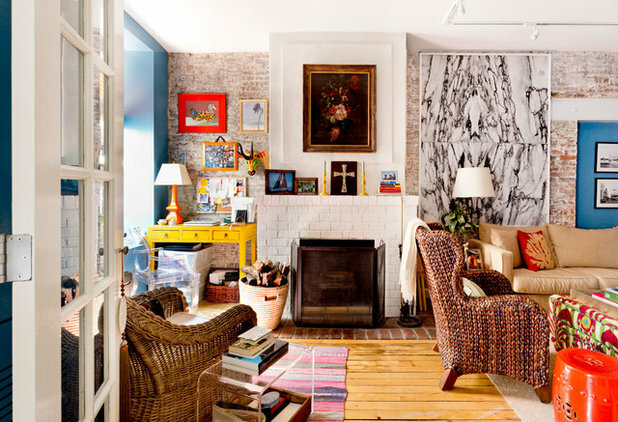 What happens here: Interior decorator and stylist Cristina Soriano works from her 800-square-foot one-bedroom apartment in the West Village neighborhood of New York. 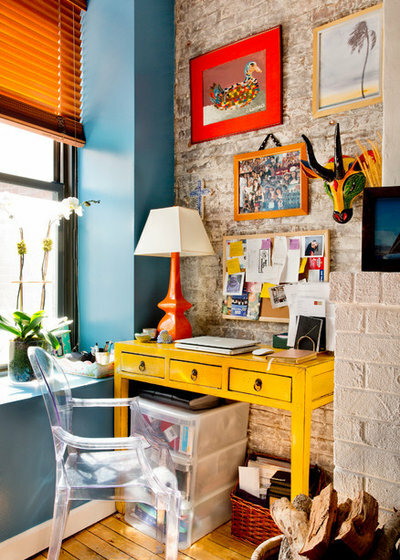 Why it works: Soriano tucked a cheery yellow desk and a Kartell Ghost chair between the window and the wood-burning fireplace in the corner of the living room to create her office area. 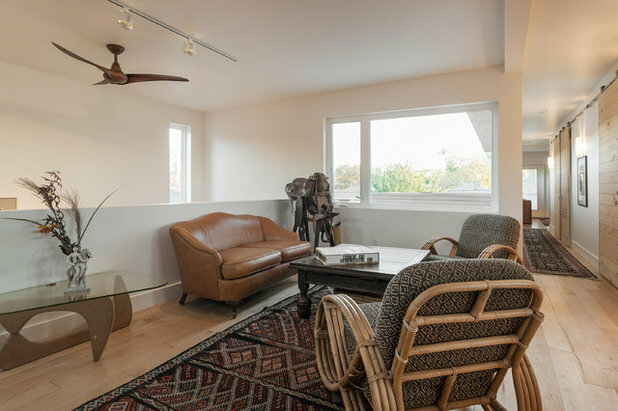 The gallery wall includes meaningful mementos: a duck she painted when she was 7, a palm tree that was a gift from artist friend Mita Corsini Bland and a caribou mask that was a party favor from her best friend’s wedding. Favorite feature: “Having a wood-burning fireplace is so special, and I count my blessings every time it snows,” Soriano says. “I’m warm-blooded, so I make any excuse to light a fire — even on a beautiful spring day. The smell, the sound and the warmth of the fire make me so happy.” Her desk’s position gives her the best of both worlds — “natural light from the warm summer sun and a crackling fire during the frigid winter,” she says. Best work-from-home perk: “I find I’m most creative and productive when I’m working in the comfort of my own space and at my own time. I’m someone who needs to sit at a table to work — even if I’m just responding to emails or reading a design book, searching for inspiration — so I love my desk. Sometimes work flows out to the dining table,” Soriano says. This little reading corner is also one of her favorite spots. 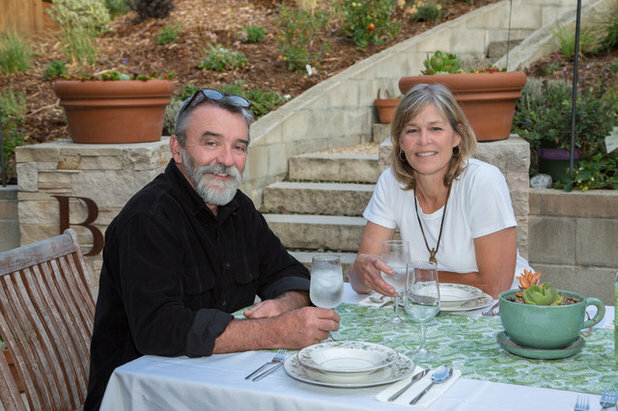 What happens here: General contractor Pat Barry and landscape architect Chris Kukula use their custom cottage in their hilly yard in Piedmont, California, as their home office. 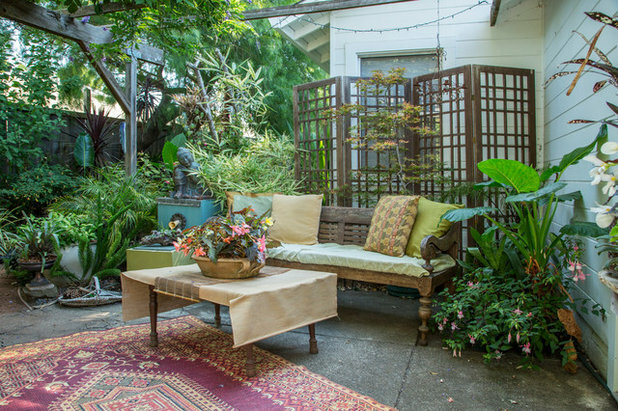 The couple reshaped their sloped 2,835-square-foot yard to create three distinct outdoor rooms: a patio off their 1920s main house, a gently sloped planting area and an upper yard for a cottage office. A demonstration garden of low-water plants has beds representing Australia, South Africa, the Mediterranean and California, and succulents provide color when the native plantings go dormant. “The garden is still a work in progress, which is fine with us,” says Kukula, pictured at right with Barry. “It gives us something to look forward to.” The limestone stairs behind the couple lead to the entrance of the cottage. 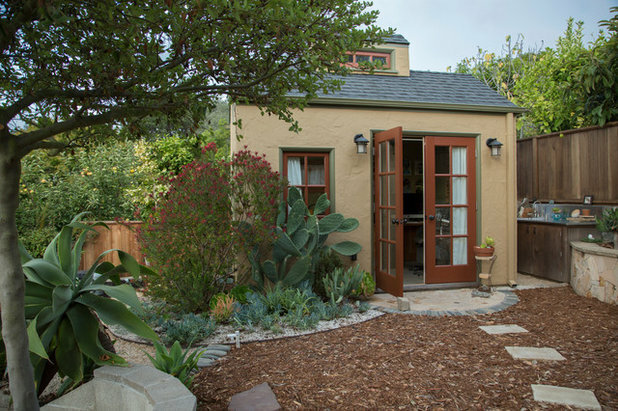 Why it works: Barry designed and built the 120-square-foot cottage, which sits at the top of the sloping backyard. Inside, a desk, filing cabinets and custom Douglas fir flat files that match the office trim run along the longest wall. 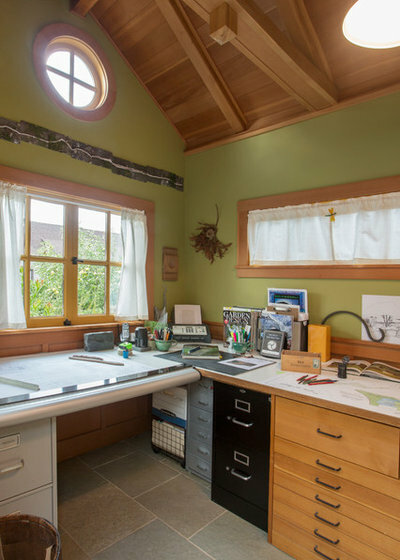 Long work surfaces provide plenty of space for laying out landscape plans. 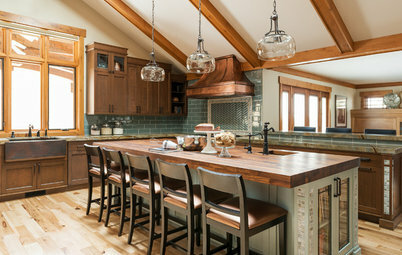 The Douglas fir used for the trim, ceiling and wainscoting was salvaged from construction jobs and from found and recycled materials. The space was designed to include more than one workstation. Typical workday: “Choosing to be self-employed means you need to be disciplined and organized. My week is a mix of field work, meetings and in-office designing,” Kukula says. 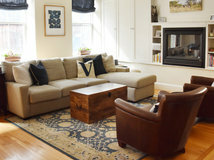 On using Houzz: “I refer clients and potential clients to Houzz. 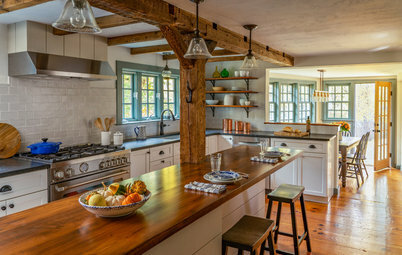 Most clients need imagery to help them convey their wish lists, and I encourage them to collect them from Houzz and other sources,” she says. 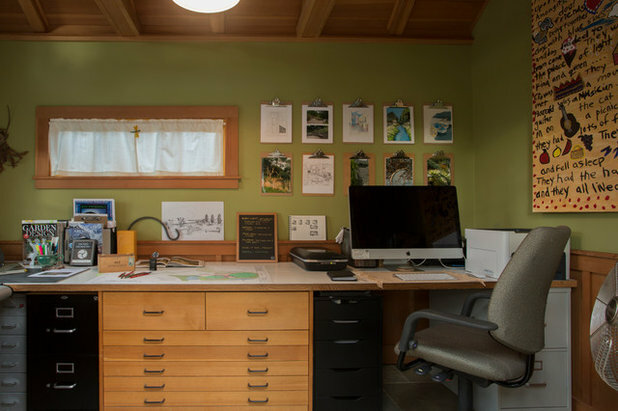 Favorite feature: Original art and drawings from past projects hang on clipboards above Kukula’s desk for inspiration. 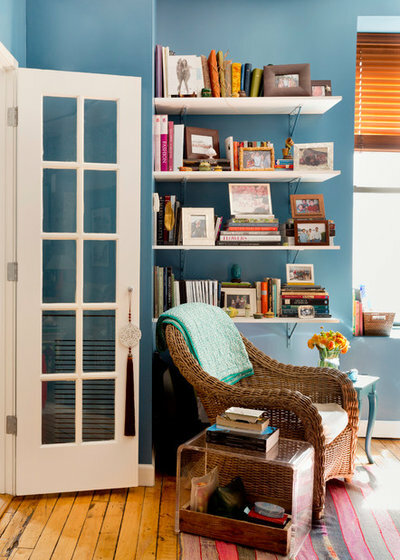 While this space is now used as the couple’s office, it could someday be converted to a guest room. Current project: Kukula and Barry just purchased 6 acres in Southern Oregon. 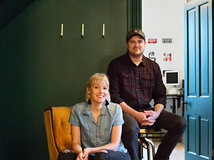 “We are transitioning to developing a guesthouse business. I will be exploring new work opportunities there that include working more directly with my new community as well as designing a large native wildflower meadow on our property,” Kukula says. 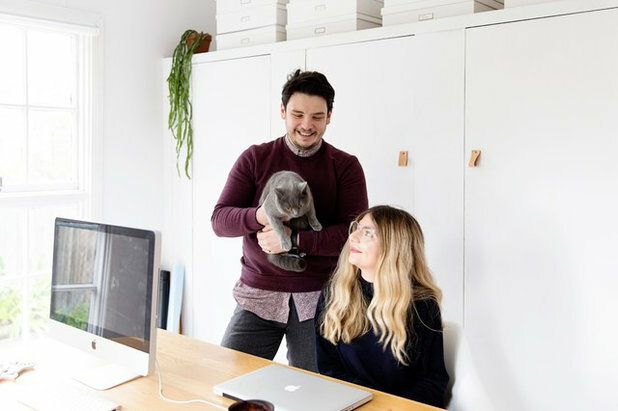 What happens here: Interior designers Joshua Reitano and Adriana Vujovic of The Salted Chair live in a three-bedroom, one-bathroom home in Rosebud, Australia, south of Melbourne. 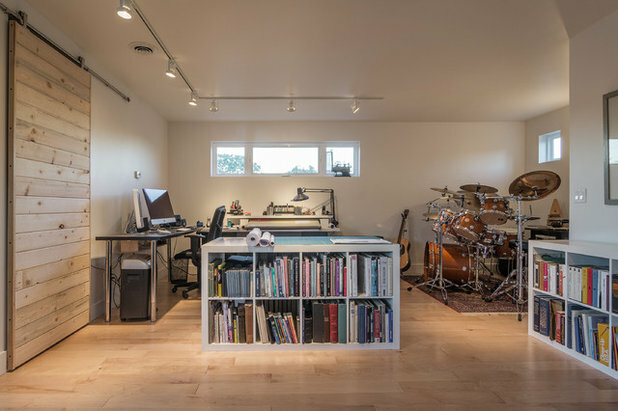 Near the back of the house is a third bedroom the couple converted into their home office to run their interior design studio. 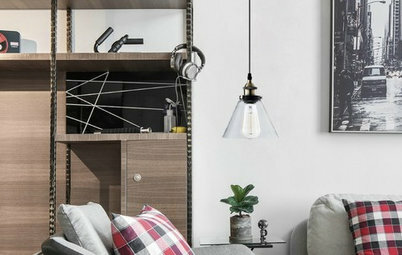 Favorite feature: The clipboard wall gets regularly updated with inspirational images, client mood boards and famous furniture references. Reitano and Vujovic also particularly love the paned windows and openness of their home office. Typical workday: Reitano and Vujovic divide their work between their beachside home studio and client visits in Melbourne. Vujovic is passionate about midcentury modern furniture and design. 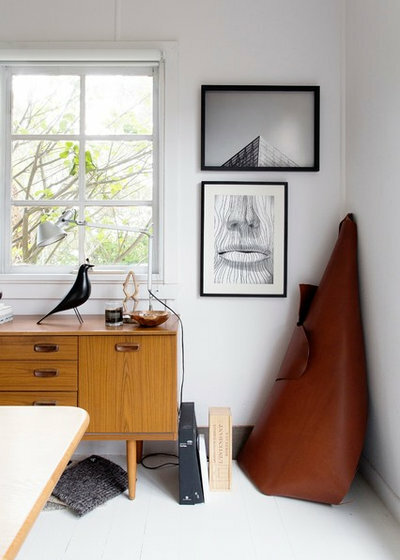 Displayed on top of the beautiful midcentury wood sideboard is an Eames bird. A black candle bought in Bordeaux, France, remains untouched in the studio as a reminder of the couple’s travels. Best work-from-home perk: Vincent has been working out of his house for 30 years. “There’s lots of perks — I got my drum set and no commuting. I’ve been playing the drums for 50 years,” he says. 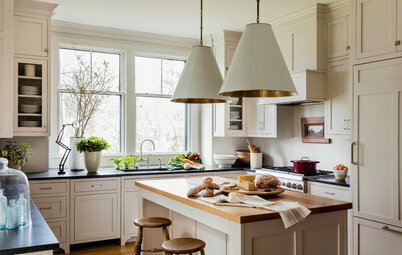 What happens here: Interior designer Allison Crawford lives in an updated Craftsman home in the South Congress neighborhood of Austin, Texas. She’s pictured in her dining room with her 2-year-old black rescue dog, Hugo, and her papillon, Pierre. Previously, Crawford lived in a two-bedroom high-rise apartment downtown. 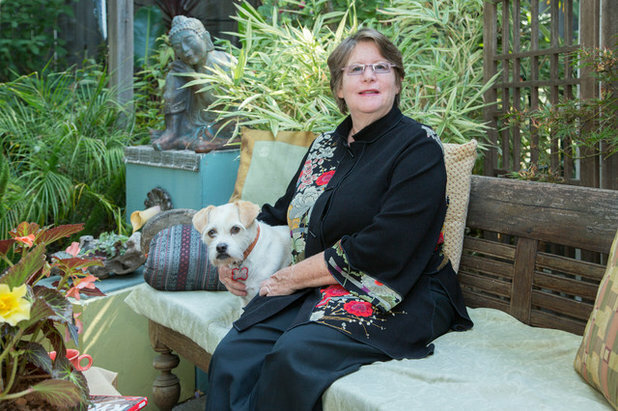 Typical workday: Crawford starts her day about 7 a.m. “I immediately let the dogs eat and have a cup of coffee. After a bite to eat, I work out and start work promptly at 9 a.m. Every workday involves different tasks like meeting with employees, public speaking engagements, interviews with the press or working on tedious accounting systems,” she says. 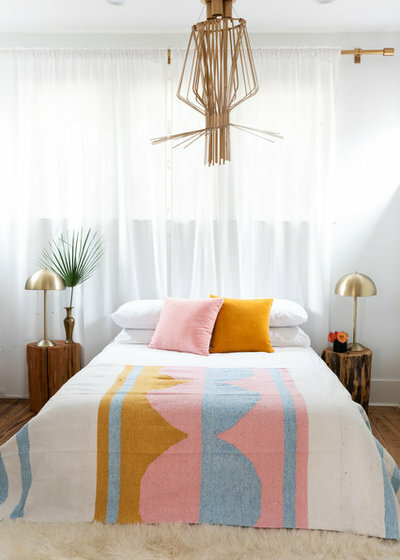 Crawford’s master bedroom is decorated with a dusty-peach color palette. 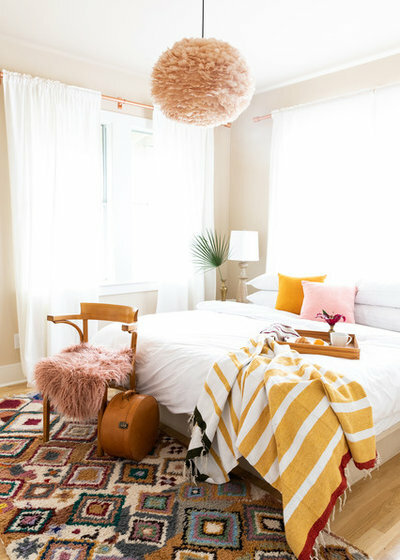 The Moroccan rug is a purchase from her recent trip to Marrakech. 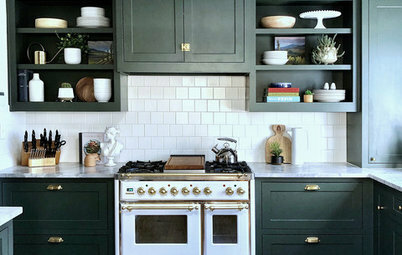 The paint color is Everlasting by Benjamin Moore. 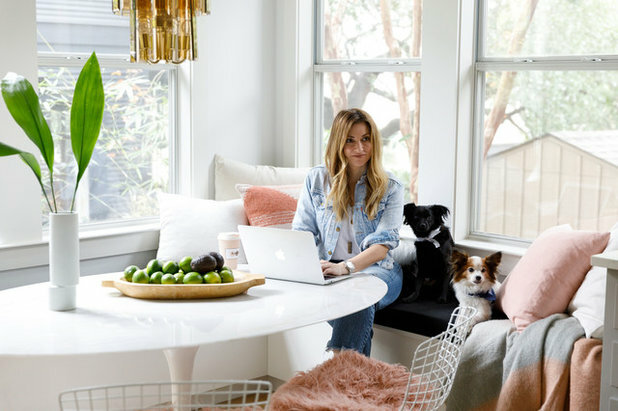 What happens here: Michelle Derviss runs her landscape design business from her home in Novato, California, and turned her second bedroom into an office. 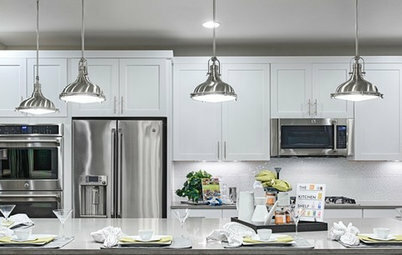 “I do all my drafting for clients by hand and use my Mayline drawing table daily to design. 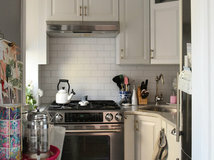 The worktop is roughly 3 by 5 feet, and I bought it used from an engineer,” she says. 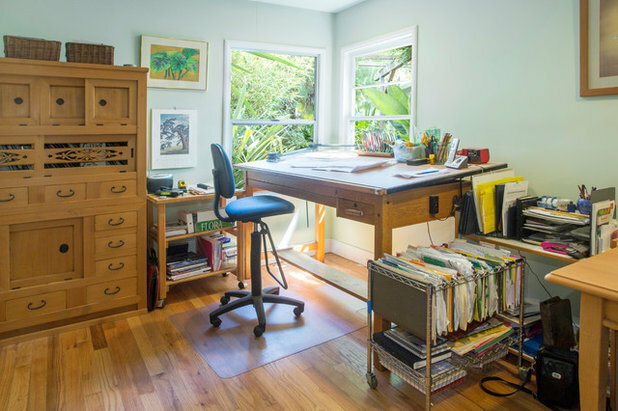 The desk is nestled in the corner with a view of a flowering trumpet tree in her side yard. 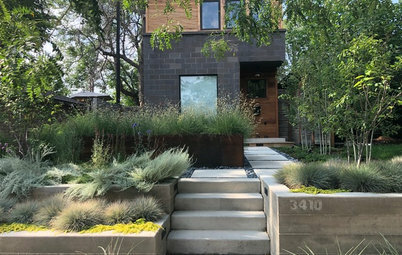 “As a landscape designer, I work in collaboration with other architects, engineers, highly trained craftspeople and property owners to bring about the most site-responsive inspirational expressions of the landscape in a sculptural manner,” Derviss says. Derviss uses the Japanese chest to store her pencils, photos, paints, books and other resource information. 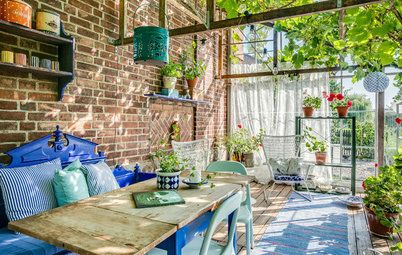 Favorite feature: She likes her backyard greenhouse for propagating seeds in the late winter and early spring for vegetables and herbs she plants in the summer. 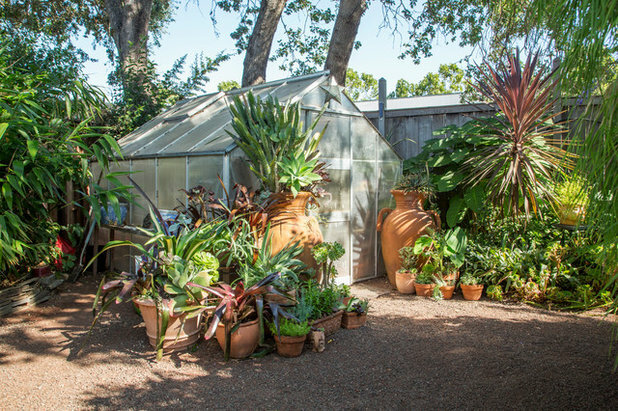 “In the wintertime, I move my tender bromeliads in there since we get three to five days of frost — some years are worse than others,” says Derviss, a member of the Bromeliad Society of San Francisco. Outside the greenhouse is a collection of terra-cotta pots. She enjoys making arrangements with her plantings; her original creations are scattered throughout her property and inside the house. I'm so glad they are showing offices with storage for files and papers. I'm tired of seeing table top desks with no drawers or filing cabinets...who can function in a space like that? 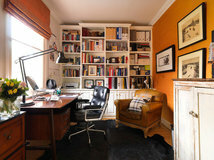 Thank you for the inspiring article on home offices! 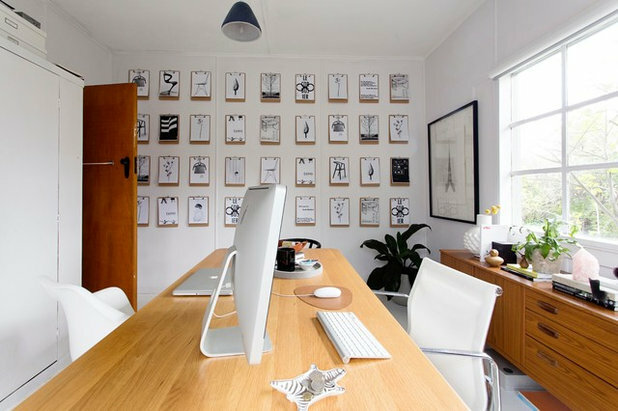 It's fun to see how other designers create their personal workspaces. 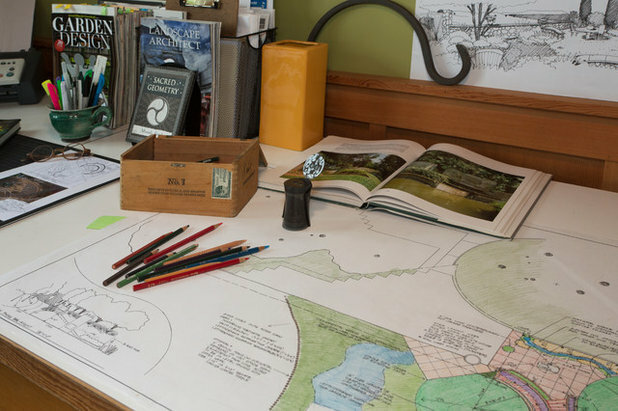 I love seeing other landscape architects/designers and their creative spaces. Thanks for giving us a peek!